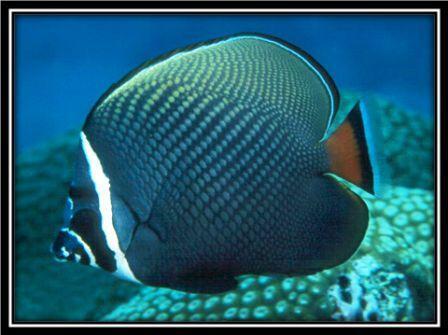 The ability to mix butterflyfishes with corals would be a wonderful boon for most reef aquarists. 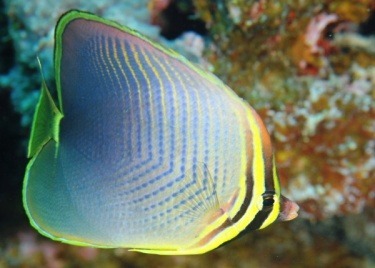 Their unique shape and coloration are second to none, and combining corals with Butterflyfish can double the pleasure. This can be a reality if care is taken to choose those fishes that are reasonably safe for the type of corals an aquarist wishes to keep. The lists shown below have been compiled by two prominent figures in the marine hobby: Bob Goemans, and Dr. Vincent Hargreaves. Fishes deemed difficult to keep/acclimate have been eliminated from the original list. Bear in mind there are few butterflyfishes that are considered even “relatively safe” around both, hard and soft corals, and by no means does this list imply that all fishes under each category pose zero threat. There will likely be some sampling taking place on occasion, but in larger, well stocked reef systems where the aquarist offers a proper and nutritious diet which closely matches their natural food source, the damage is likely to be unnoticeable. 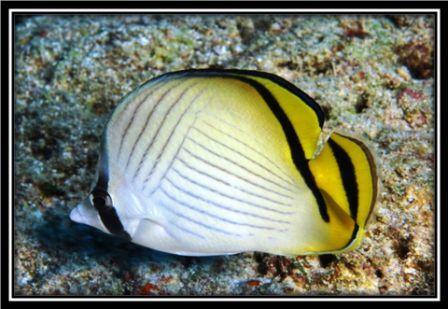 Again, the key word is “relatively” safe, as there are many aspects that still need to be realized, researched, and taken into consideration before one can be assured that a given butterflyfish will be completely safe around his or her corals. Butterflyfish are some of the most beautiful fish found on the reefs, and unfortunately many of these can be moderate to difficult to acclimate to captive conditions. Butterflies are generally community fish in nature, though some more pugnacious species may terrorize smaller or more docile fish. There are a few species considered easy to keep. Large mature tanks (six months minimum) with a good supply of quality live rock and the absence of competing and/or aggressive fish will increase the degree of success in acclimation and must be considered before purchasing any of these fish. 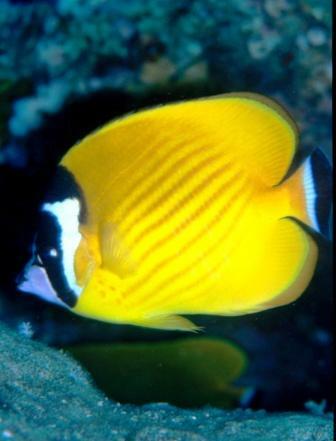 Most species will require at least a 70 gallon tank, and with butterflyfish, larger is better, and will increase your chances of long term survivability and success. Feeding a proper and nutritious diet fed in small amounts several times per day is highly recommended. The natural food sources for each species will be listed. 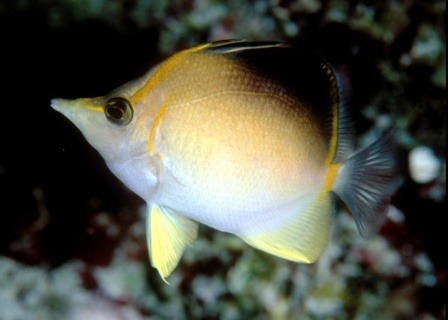 Some of the best species of butterflyfish can be difficult to acclimate to prepared foods, especially on introduction. It is important that an adequate, sustainable food mix be found soon, and offered often. Live brine shrimp and/or Copepods are a good starter for fussy newcomers as are various types of worms and crustaceans available in live and frozen form. Other meaty foods such as squid, minced clam and prepared blends can also be offered in small quantities. For stubborn feeders, a paste mixture of the above foods which can then be applied to a “feeding stone” will help trigger feeding and shorten the acclimation time toward feeding prepared foods. There are a handful of these fishes that are rather easy to acclimate to prepared foods and most of these are commonly seen at marine fish dealers and also mentioned under notes. Water conditions for this family of fish must be of excellent quality which improves their health and resistance to parasitic and fungal diseases. A consistent pH range of 8.2-8.3 should be maintained with a temperature range of 75-85 degrees. There are a few deeper water species that fare much better with cooler water temperatures and these fishes must be investigated further before purchasing. The use of an efficient protein skimmer is a must and ozone is recommended, but not absolutely necessary for success. Tankmates must also be chosen carefully so no compatibility/territorial issues arise. Some species do better kept in pairs or groups. With that being said, let’s look at our first list. Distribution: Indo-West Pacific: Persian Gulf and Maldives to Japan, the Philippines and Indonesia. Natural Foods: Live polyps, other Cnidarians, gorgonians, tunicates, worms, and crustaceans. Associations: Occur in coral reefs in pairs or several aggregations; although in captivity they may act aggressively to members of their own species. 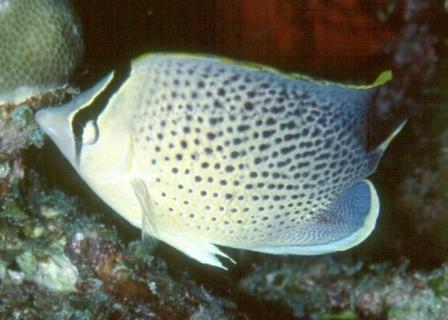 The Reticulated Butterflyfish (C. reticulatus) is a near match of C. collare in appearance, but has a less brown hue and light blue instead of red in its black based tail. These two species are occasionally found in association in the Western Pacific. Usually found on the reef edge and upper slope. Pairs form during breeding. Notes: Groups of two or more increase your success rate in keeping this species long term. Distribution: Pacific Ocean: Australia to Fiji, Samoa, Tuamoto Archipelago and the Society Islands. Associations: Over reefs and rocks. Notes: This fish is best kept in very large, peaceful community aquariums decorated with large amounts of live rock. 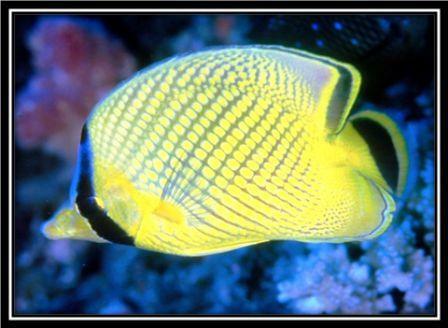 It should not be kept with conspecifics or similar butterflyfish, and should not be kept with any stress-inducing fish. Most can adapt easily to tank life and willingly accept nearly all kinds of food. Distribution: Indo-Pacific: Christmas Island in the eastern Indian Ocean to the Line Islands, north to the Ryukyu Islands, south to Rowley Shoals and the northern Great Barrier Reef; throughout Micronesia. 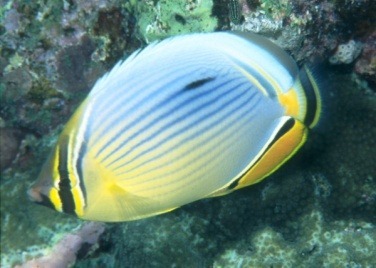 Replaced by Chaetodon guttatissimus in the Indian Ocean. Associations: Common in coral rich areas and clear waters of lagoon and seaward reefs. Sometimes found on outer subtidal reef flats. Often seen in pairs during breeding. Juveniles are secretive. Notes: Provide numerous hiding places and calm tankmates. Most will relish chopped sea food meats and algae based meals. Distribution: Indian Ocean: Red Sea south to Durban, South Africa and east to Christmas Island. Reported from western Thailand and Bali, Indonesia. Natural Foods: Feed on polychaetes, coral polyps, and algae. Associations: Inhabit lagoons and seaward reefs. Occur in pairs or small groups, form pairs during breeding. Notes: Aggressive to others in the family. Rarely seen in the trade. Requires a varied diet with numerous small feedings per day. Distribution: Indo-Pacific: Sri Lanka to the Tuamoto Islands, north to southern Japan, south to the Great Barrier Reef; Palau (Belau) to the eastern Caroline Islands in Micronesia. Natural Foods: Feeds on sea anemones, polychaetes, and octocorallian. Scleractinian coral polyps may be sampled. Associations: An uncommon species found in areas of rich coral growth of lagoon and protected reef flats and seaward reefs. Notes: This species should be offered algae stones and the so-called ‘feeding stones’ which are prepared by spreading the food pulp over the stone. Chopped sea food meats are recommended as well. This species will display a dark spot on the front part of the body when stressed and/or sleeping. Provide peaceful tankmates and plenty of hiding places to go when stressed. Not to be trusted with sea anemones. Natural Foods: Polychaete worms, coral polyps, crustaceans and mollusk eggs. Associations: Adults may form plankton feeding aggregations of up to 20 individuals, and occasionally clean other reef fishes which join the group, such as grunts, parrotfishes and surgeon fishes. 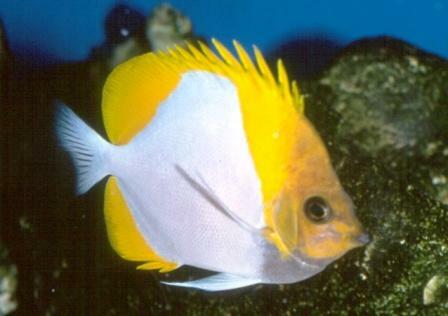 Notes: Can be difficult to acclimate to prepared foods, but once acclimated, this fish is quite hardy and well behaved toward other fish members of the tank. Provide a vitamin enriched diet of meaty foods and plenty of nooks and crannies. This fish prefers lower water temperatures in the range of 70-79 degrees. Distribution: Eastern Pacific: Society Islands, Tahiti, and Tuamoto Islands. Despite its relatively limited distribution range, this species occurs in large populations. Natural Foods: There is limited knowledge of its diet, but it has been seen to feed off the substrate and plankton. Associations: Generally localized to just a few islands in French Polynesia. 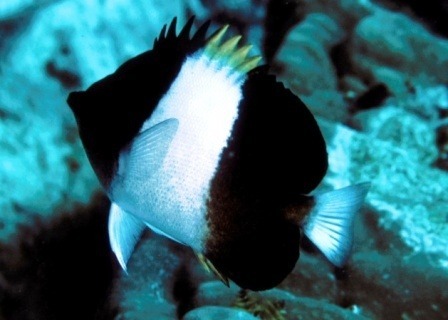 Found in lagoon reefs, usually solitary or paired. Form pairs during breeding. 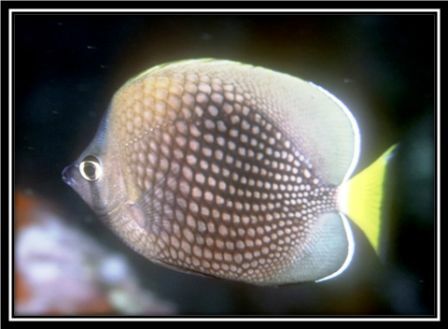 Notes: A good species of butterflyfish to start with for aquarists with limited experience.“It is the easiest of all the butterflyfishes to keep and will readily take flake food out of the hand once acclimated. It is hard to kill. Great in trios until a pair is established, and then the third individual must be removed before it is killed by the other two. But they must all be the same size. I have a breeding pair in my main tank at the moment.” Dr. Vincent Hargreaves, marine biologist. Distribution: Indo-Pacific: Red Sea and East Africa to the Line and Tuamoto islands, north to southern Japan, south to the Lord Howe and the Austral islands. Natural Foods: Omnivorous, feed on algae, coral polyps, crustaceans and worms. Associations: Found in reef flats, lagoon and seaward reefs and sometimes in turbid waters subject to freshwater runoff. Swim in pairs. Stable monogamous pairs with both pair members jointly defending a feeding territory against other pairs, but often accompanies other species without being aggressive. 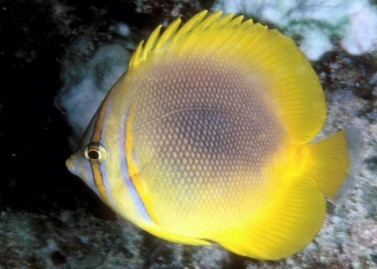 Notes: Closely related to Chaetodon decussates. 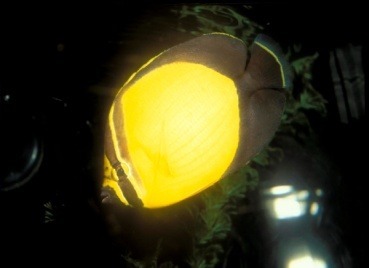 One of the easiest butterflyfishes to acclimate to captive conditions. Can be kept in pairs. Distribution: Western Pacific: Japan to Thailand; including the Ryukyu Islands, Taiwan, the South China Sea, and the Gulf of Thailand. 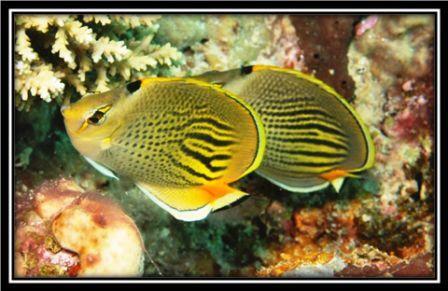 Associations: Occur in rocky and coral reef areas where they are found in pairs and small groups. Form pairs during breeding. Care Level: Moderate. 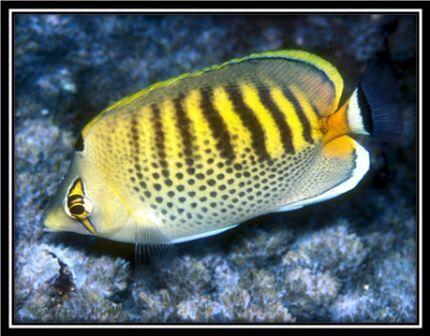 Rarely seen in the trade, but actually a good reef aquarium fish. Notes: Requires vitamin enriched meaty and algae based foods fed numerous times per day. Distribution: Indo-Pacific: East Africa to the Hawaiian, Marquesan, and Pitcairn islands, north to the Bonin (Ogasawara) Islands, south to New Caledonia and the Austral Islands; throughout Micronesia. Natural Foods: Feeds mainly on whole organisms such as small crustaceans. Associations: A generally uncommon species that inhabits seaward reefs to depths greater than 60 meters. Care Level: Moderate to difficult. Notes: Occasionally seen in the trade. 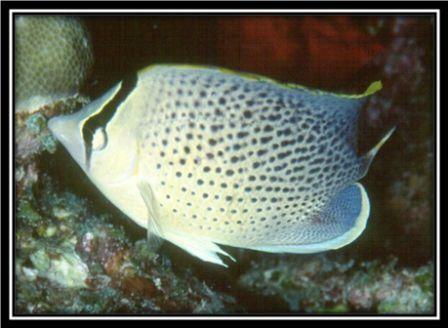 Do not confuse with Forcipiger flavissimus which is not suitable for reef systems. Plenty of healthy live rock is suggested for this species. Small size frozen foods such as Cyclopeeze may entice it to feed. A seafood paste applied on a Brain Coral skeleton or rock is also suggested. Live pods are generally irresistible. Distribution: Pacific Ocean: Christmas Island in the eastern Indian Ocean to Indonesia and the Hawaiian, Line, and Pitcairn islands, north to southern Japan, south to Rowley Shoals and New Caledonia. 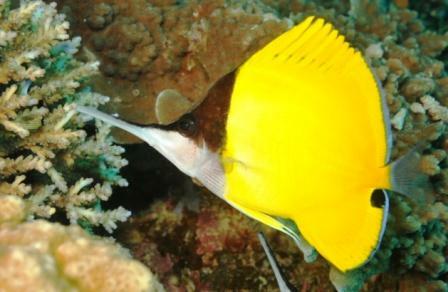 Replaced by Hemitaurichthys zoster in the Indian Ocean. Associations: Occur in large schools that may extend several meters above the edges of steep current-swept outer reef slopes. Form pairs during breeding. 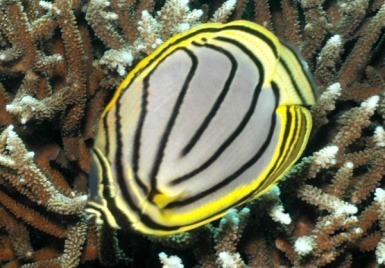 Notes: Likely one of the safest butterflyfish to keep with both hard and soft corals. It usually will accept most foods offered, including finely chopped seafood, frozen or live brine shrimp, frozen preparations, crustacean flesh, mysid shrimp and frozen preparations, and even flake food. Distribution: Indian Ocean: East Africa to Guam, north to India, south to Mauritius. Associations: Inhabit open water off the reef edge to depths greater than 35 meters. Form large schools and form pairs during breeding. Notes: One of the hardiest butterflyfishes that is safe with all corals. Mainly a plankton feeder. Distribution: Indo-Pacific: Western India to Pitcairn Islands, north to southern Japan, south to Rowley Shoals, southern Queensland, and New Caledonia; throughout Micronesia. Associations: Common in coral-rich areas of subtidal reef flats and lagoon and seaward reefs. Juveniles solitary and usually found in estuaries and lagoons. Form pairs during breeding. Notes: Easily maintained in the aquarium and will accept a wide variety of foods, including fortified brine shrimp, mysis, and chopped seafoods. Herbivore food should also be offered. Requires several feedings per day. The yellow snout remains through adulthood. May be kept in pairs if introduced at the same time otherwise territorial disputes may arise. This fish acclimates much better if kept with docile tankmates. Distribution: Pacific Ocean: Indonesia to the Society Islands, north to southern Japan, south to Rowley Shoals and New Caledonia; throughout Micronesia. Reported from Christmas Island in the eastern Indian Ocean. 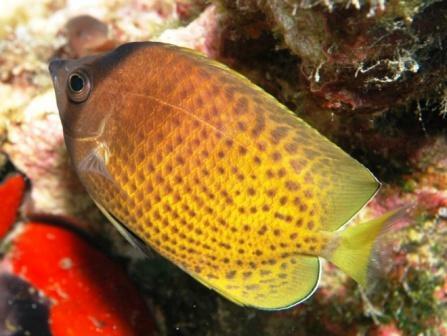 Replaced by Heniochus pleurotaenia in the Indian Ocean. Associations: Occur in deep lagoons and steep outer reef slopes, with mixed algae and coral growth. Solitary or in small groups. Form pairs during breeding. Notes: Adults develop a prominent hump on the forehead and a curved horn above each eye, and lose the elongate dorsal filament. If frightened, feeding may stop. Keep with docile tankmates and provide caves and overhangs for security. Distribution: Western Atlantic: southern Florida and the western Gulf of Mexico to the West Indies-Caribbean region and Venezuela. Natural Foods: Feed on small invertebrates. Often seen nibbling on the tube feet of sea urchins or the tentacles of tubeworms, other annelids. Associations: Inhabit deep coral-rich reefs and drop-offs. 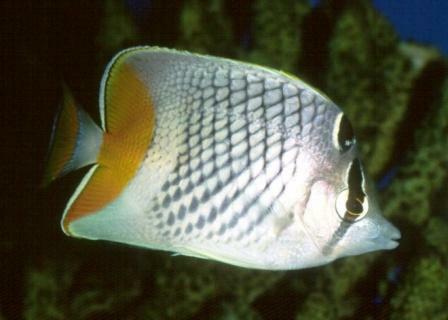 Unlike some chaetodonts it does not pick parasites from the bodies of other fishes. Solitary, sometimes seen in pairs. Seeks refuge when approached. Form pairs during breeding. Notes: Rarely seen in the trade. Requires a varied diet including frozen foods and quality flake foods. Black worms and/or bloodworms may be required to get it feeding. Three to four feedings per day recommended. Can acclimate to captive conditions well if provided hiding places to retire at night. Docile tankmates highly recommended. Distribution: Indo-Pacific: Red Sea and East Africa (extending to Mossel Bay, South Africa, to the Hawaiian, Marquesan, and Ducie islands, north to southern Japan, south to Lord Howe and Rapa islands. Natural Foods: Feed mainly by tearing pieces from polychaetes, sea anemones, coral polyps, and algae. Associations: Benthopelagic. 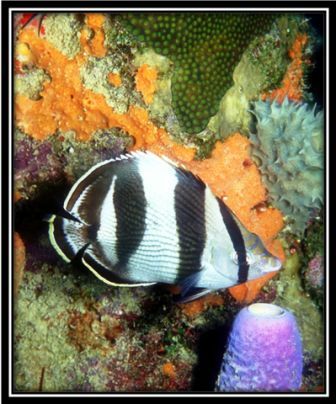 May be seen in a variety of habitats ranging from rich coral reefs to weedy and rubble covered areas. Maybe found singly, in pairs, and in aggregations that roam over large distances in search of food. Form pairs during breeding. 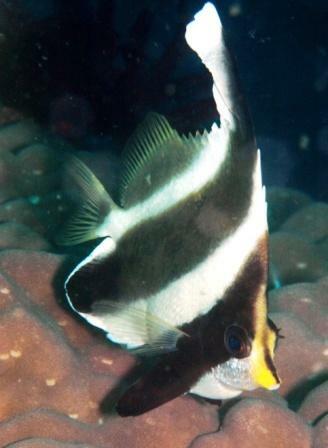 Notes: Juveniles have a black bar over the head that hides the eye and an eye-sized black spot on the soft dorsal fin. Requires numerous feedings per day. If introduced first into the aquarium, it will establish its territory and aggressively defend it. If this fish is to be kept with other butterflies, introduce it last. Needs plenty of rock work with caves for security. Readily accepts most foods, and is one of the hardiest butterflies in the trade. Not to be trusted with sea anemones. Distribution: Indian Ocean: East Africa south to 27°S and east to Indonesia. Natural Foods: Feeds mainly on invertebrates. Associations: Found on the reef edge and upper slope. Usually in current-prone habitats; juveniles secretive in corals. Generally seen in pairs or in small aggregations. Form pairs when breeding. Notes: Feed a variety of enriched frozen foods (meaty and algae), quality flake foods may be supplemented as well. Numerous feedings per day recommended. Difficult feeders can be started with black worms, bloodworms and/or unwanted anemones. Needs plenty of swimming room, especially for adults. Provide plenty of live rock with open caves for security. Associations: Inhabit lagoon and seaward reefs. Occur in pairs or small groups. Form pairs during breeding. Notes: Rarely seen in the trade. Aggressive to conspecifics. Requires a varied diet with numerous feedings per day. Natural Foods: Feed mainly on soft coral polyps (mainly on Sarcophyton tracheliophorum and Litophyton viridis), algae and zooplankton. Associations: Occur in deeper lagoons and channels, and seaward reefs. Benthopelagic. Occur singly or in pairs. Form pairs during breeding. Notes: Can be quite shy on introduction but once acclimated can be quite hardy. Requires a variety of frozen foods both meaty and green and can be supplemented with quality flake foods with numerous feedings per day. 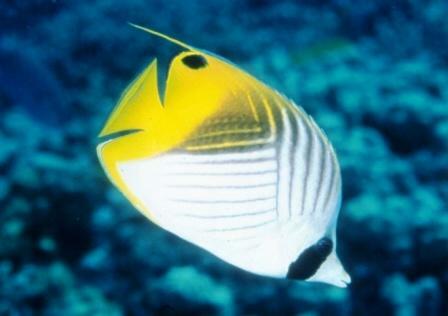 Gets along well with members of its own species and/or other butterflyfish. 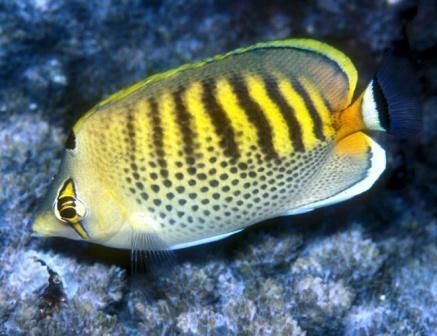 One of the easier butterflyfish to keep. Natural Foods: Feed on filamentous algae, corals, and benthic invertebrates. Associations: Common in coral rich areas and clear waters of lagoon and seaward reefs. Sometimes found on outer subtidal reef flats. Juveniles secretive. Often in pairs during breeding. Occasionally hybridize with C. pelewensis in the southern part of its range. Notes: Will accept most aquarium foods including algae products. Live foods may be needed to induce feeding. Prone to marine Ich. Can be kept with others of the family. Natural Foods: Feed on sea anemones, polychaetes, and octocorallian and scleractinian coral polyps. Associations: An uncommon species found in areas of rich coral growth of lagoon and protected reef flats and seaward reefs. Often in pairs. Form pairs during breeding. Notes: In captivity, this species should be fed algae stones and the so-called ‘feeding stones’ which are prepared by spreading the food pulp over the stone. Peaceful tankmates recommended. 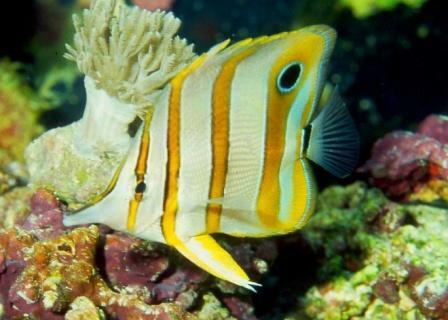 One of the easier butterflyfish to keep. Not to be trusted with sea anemones. Distribution: Western Pacific: Indonesia and the Philippines, north to the Ryukyu Islands. Natural Foods: Feed on small benthic invertebrates and algae, similar to C. mertensii. Form pairs during breeding. Associations: Clear coastal to outer reef slopes and drop-offs. Found around staghorn corals. The only member of the family with a crosshatch pattern of dark lines on the sides. Generally seen below 15 meters depth and occurs singly or in pairs. Notes: If keeping more than one, introduce at the same time. Accepts a wide variety of aquarium foods. Vitamin enriched meaty diet recommended. Peaceful tankmates recommended. 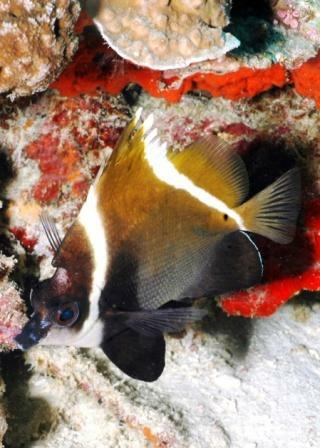 One of the easier butterflyfish to keep. Distribution: Western Pacific: Andaman Sea to Ryukyu Islands and Australia. Natural Foods: Tubeworms, benthic invertebrates. Associations: A common species found singly and in pairs along rocky shores and coral reefs; also in estuaries and silty inner reefs. Form pairs during breeding. Notes: A territorial species. Distinguished from C. marginalis by its color pattern and number of dorsal fin rays (fewer in C. rostratus). Easily maintained in the aquarium if the right conditions are provided and accepts a wide variety of foods. Relishes Tubifex worms and Aiptasia anemones. Will decimate tubeworm populations. Peaceful tankmates recommended. Natural Foods: Feed on zooplankton and algae. Associations: Inhabit open water off the reef edge, to depths greater than 35 meters. Form large schools. Form pairs when breeding. Notes: Diet should consist of frozen and freeze-dried foods containing algae are good substitutes and can be supplemented with dried algae and vitamin enriched brine and mysis shrimp. Best kept in small groups. Does not appreciate brightly lit aquariums, ledges should be provided to offset this. One of the very few butterflyfishes that are entirely reef safe. The butterflyfishes shown below should not be purchased because of their specific dietary needs. All of them are obligatory coral feeders and are very difficult to keep. all photos are courtesy of Bob Fenner.